It’s marathon Sunday in New York and it will be a busy one for the Shamrocks too with games in Queens, Brooklyn and Manhattan where the day will begin early for the women’s team. Struggling Manhattan Kickers will host the Rocks at 9am in East River Park but player/c0-manager Tricia Reed will be taking nothing for granted as the league leading women in green bid to extend their winning streak to seven games. 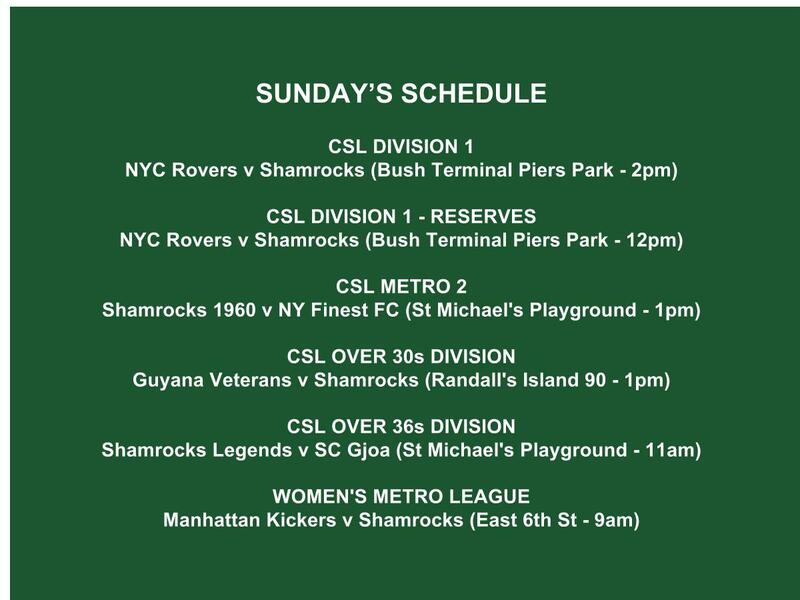 Meanwhile, in the first division of the Cosmopolitan Soccer League, fourth-placed Shamrocks face another crucial match-up when they travel to Brooklyn to take on NYC Rovers (Bush Terminal Piers Park – 2pm). Held at home last week by a dogged CPR outfit, Kevin Grogan’s first team are a point ahead of their following two November opponents in the league, NY Athletic Club and Manhattan Celtic, who face each other on Sunday at Travers Island. Rovers, meanwhile, are having a tough campaign so far, bottom of the table without a victory and having lost to Celtic and Polonia in their previous two games. The reserves game – kicking off at 12pm – also has a lot riding on it with both teams tied in third on 12 points. Rovers are in flying form, coming into this one with four victories on the bounce. With a few new faces added to his squad, reserves boss Stevie Doyle is hoping last week’s battling 3-1 win against CPR will kickstart a good run. “This is our toughest test of the season but I am looking forward to what should be a cracking game,” said Doyle. “Both teams have only lost one game so far so I’m predicting it will be a close encounter. “I’m very proud of the team’s performance last week under difficult circumstances but we showed great character and toughness to take all three points. Darren Coleman has been the stand out player this season with his scoring abilities and hit the net again as he has from the get go. A depleted Over 30s team will face Guyana Veterans in Randalls Island 90 at 1pm with Paddy Mc Carry’s league leaders bidding to maintain a three-point gap over CPR Old Boys at the top. Guyana have won three in a row and beat Nieuw Amsterdam 3-2 last week to move them to third, keeping them within four points of the Rocks. “Sunday’s game is very important – first v third,” said coach Paddy Mc Carry. “We are missing five players for this game so the squad will be used to the fullest on Sunday. But we will still have a very strong 11 out there and I expect to go there and take the three points. Meanwhile, Shamrocks 1960 will be hoping to bounce back from their 2-0 loss to New York United when they face NY Finest at St Michael’s on Sunday at 1pm. NY Finest have won just won game from their four so far this year but 1960 gaffer Andy Connolly is focused on getting his own side back to winning ways. The Legends will play three-win SC Gjoa in the curtain raiser at St Michaels at 11am. This will be a special occasion due to the launch of their new set of jerseys sponsored by Joe Connolly and Solas Electric.